The biggest party of the year is back! Multiple patio bars, delicious slow-smoked BBQ, Coors Light beer trucks, the Joe Slick Band (formerly Bullet Creek that has come to Oregon to play at this event many years), Crown Royal girls, and Country swing dancing under the big tent. Here are the top 5 reasons why you shouldn’t miss this party. 5. FREE on Wednesday – No cover charge on Wednesday, June 8th! That’s right. Kick off the 2016 Sisters Rodeo After Party at Sisters Saloon with Dry Canyon Stampede – an 8 piece country western band that will be sure to make you move. We are very excited to welcome you to our spacious outdoor patio to drink, eat and dance the night away. 4. Thursday Locals Night – It’s the biggest event of the year in Sisters. Mingle with locals and visitors alike on Thursday, June 9th at the Saloon! Beer, wine and cocktails will be flowing while the incredible Joe Slick Band performs on our main stage. Chat with anyone from Sisters and they’ll be happy to tell you about the rich history of the rodeo and Sisters town. 3. The Dancing – If you love to dance, then dust off those boots and kick up your heels at the upcoming four-day celebration at the Saloon. 2. 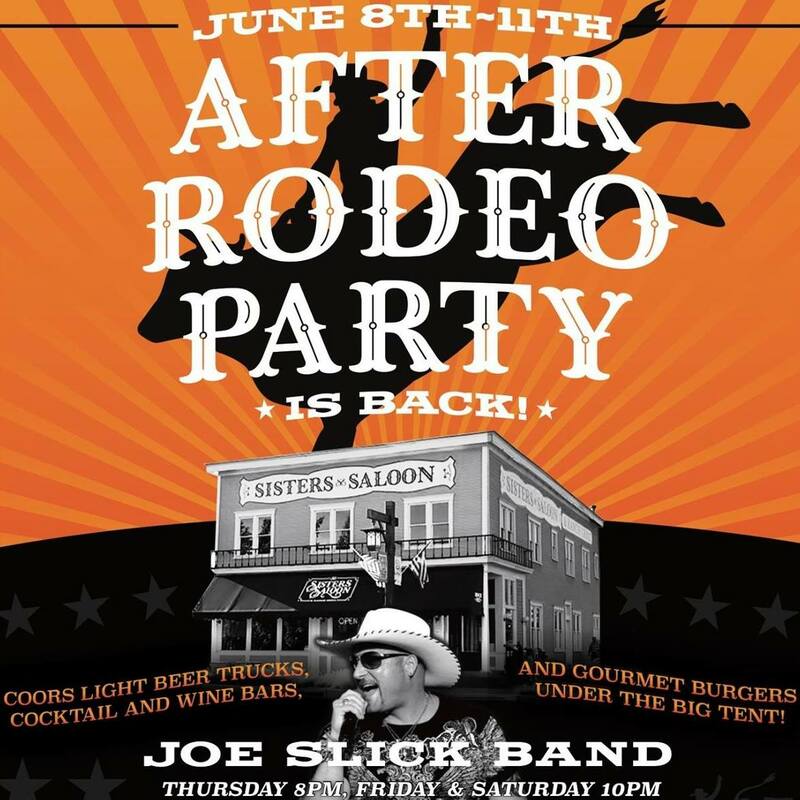 Best Food in Town – This year, Sisters Saloon will be serving up a special BBQ menu all night long during the after party events. Enjoy Traeger-smoked ribs, chicken, and pulled pork or try our delicious gourmet burgers. Our beef is 100% natural from local, grass-fed steers. Yum! 1. Experience A Local Tradition – We love welcoming guests to the historic building Sisters Saloon now inhabits. Before dancing the night away, take a peek at our restored photographs of the old city of Sisters. The legendary Hotel Sisters was built in 1912 and still stands as one of the most photographed buildings in Central Oregon. We look forward to seeing you at the rodeo and at the after party at Sisters Saloon.